With the support of National Bank, Tennis PEI will be hosting the biggest tennis event of the year—the National Bank 2018 PEI Tennis Championships on August 17-19 at the Victoria Park Tennis Courts in Charlottetown. Entries are now being accepted online using the Tennis Canada Tournament software (click here, click here, or here) or by emailing programs@tennispei.ca. This event will be limited to PEI residents only (summer residents included). All players must have current Tennis PEI memberships (Adult $25, Junior $15). The entry fee is $5 per event. The entry deadline is Tuesday August 14 at midnight. Please note that events will be combined if entries are too small. This tournament will offer events to appeal to all levels of skill. A total of $500 in prize money will be split among the various events depending on the entries. 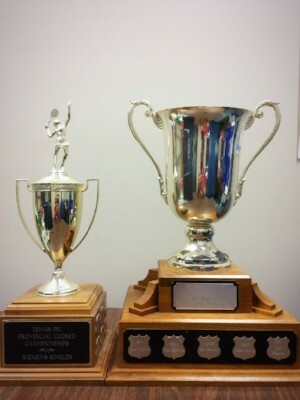 The province’s top players will compete in the Open events which will determine provincial champions for Men’s singles, Ladies’ singles, Men’s doubles, Ladies’ doubles, and Mixed doubles. All matches in these events will be 2 out of 3 sets with the third set being a 10 point tie-break except for consolation matches which may be shortened to pro-sets. In order to encourage more participation, we are offering events for beginner players and intermediate players. Beginner events are identified by the number 2.5 in the event name while intermediate events are identified by 3.5 in the name. These numbers correspond to the description explained on “What’s My Level” on the Tennis PEI website. Men’s and Ladies’ singles events are offered at both the 2.5 and 3.5 level while Men’s and Ladies’ doubles events will be offered at the 3.5 level. If you have questions about the levels, contact programs@tennispei.ca. The format of these matches will be decided after the number of entries is known. For Masters players, we are offering the following singles categories: Men’s over 30; Men’s over 50; and Ladies’ over 40. All matches in these events will be 2 out of 3 sets with the third set being a 10 point tie-break except for consolation matches which may be shortened to pro-sets. We are also offering the following Masters’ doubles categories: Men’s over 50; Mixed over 50; and Ladies’ over 40. The Men’s Over 50 Doubles will have 2 divisions with short matches being played so that players will be finished by 1 pm on Saturday. The format of these matches will be decided after the number of entries is known. For more information, please email ed@tennispei.ca or programs@tennispei.ca or by phoning Don Cameron at 902-213-0117.